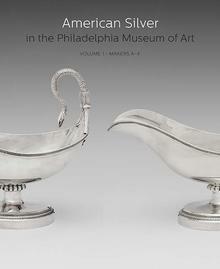 Join Library Company Trustee Emerita, Beatrice B. Garvan, the Curator Emerita of American Decorative Arts and David L. Barquist, the H. Richard Dietrich, Jr., Curator of American Decorative Arts both of the Philadelphia Museum of Art as we hear about their new publication and research exploring the history of American Silver. Beginning with Cesar Ghiselin in 1681, Philadelphia has a long and storied history of silversmithing that includes notable artists such as Joseph Richardson Sr. and Jr., Philip Syng Jr., and Olaf Skoogfors. Celebrating this legacy and showcasing the Philadelphia Museum of Art’s extraordinary and comprehensive collection of American silver, join the Library Company for this exciting Book Launch! Reception and Book signing to follow. This program is co-sponsored by the Library Company of Philadelphia and the Center for American Art, Philadelphia Museum of Art.